The audience is as integral a part of that roomful of people as the actors and director. “I don’t think most audience members realize how potent they are,” said Gottberg. Actors constantly track the audience’s response and then adapt what they do on stage, she said. But theater goes beyond the basic medium to create deeper possibilities. “For me, theater is a forum where people can come together from many backgrounds, talk about big ideas, and can become unified. It feels inclusive, feels good,” she said. This dynamic interrelationship is heightened at an intimate theater like the Merc, which seats just 150. Now in her third year there, Gottberg finds leading a community theater is consistently challenging and satisfying. It’s Gottberg’s job to select shows, with input from the board of directors and a programming committee. 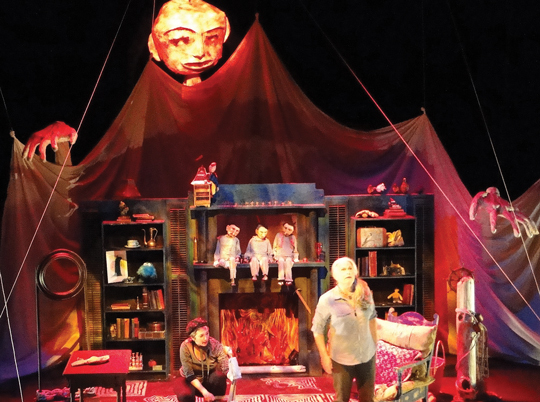 Planning the season is a balancing act, mixing thought-provoking drama with time-tested favorites and children’s theater, and identifying plays that can be done with a small pool of local actors and limited sets – limited by space and budget. (Photo left, Mirabelle, A Breeze by Ki Gottberg, music by Casey James, at Seattle University. Scene design by Carol Wolfe Clay. Gottberg has spent almost all of her adult life in theater – acting, teaching, and directing – but she didn’t act at all until she had a minor role in college. In fact, she had always expected her involvement in art would be as a creator of visual art, not live performance. “I was interested in political art – in printmaking, where I could make multiple images,” she said. “I was very interested in art that’s not exclusive.” Making prints fulfilled some of those goals, but it also felt too solitary. (Photo left, The Hairy Baby by Ki Gottberg at Seattle University. Scene design by Carol Wolfe Clay. Gottberg took a break from college to spend a year in Germany with relatives (her father was German and fled persecution during WWII). She began going to the theater, in part to improve her German, but she also found herself attracted to the whole environment. “Theater was really rich – people were collaborating all the time,” she said. Gottberg’s explorations also took her to a utopian community in Japan, part farm and part artists’ collective. To earn money in Japan, she found work as a fashion model, which necessitated its own version of performance. “It was a fluke,” she said, “but I learned to embody ideas with my body.” The modeling work enabled her to assemble a portfolio for acting auditions when she returned to the U.S.
Gottberg landed a few small parts, but it took two years before she was accepted (by audition) to the graduate theater program she wanted to attend. “In grad school, you’re basically in an acting company – it was on-the-ground experience, super-intensive,” she said. They did everything from musicals to comedy to Shakespeare, and every student acted, sang, and danced. She also started to write for theater. After graduation, Gottberg worked in contemporary theater in Seattle and Portland, writing and acting as much as possible. She paid the bills by doing voice-overs for commercials and was the voice of the Bon Marché department store for seven years. 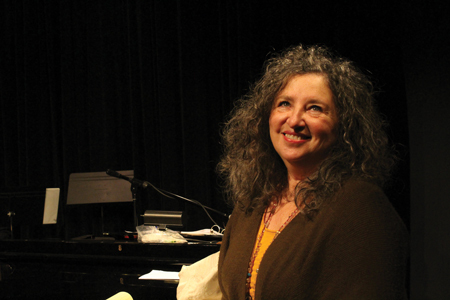 She soon began to teach at Seattle University, where she has been a professor of theater for almost 30 years. 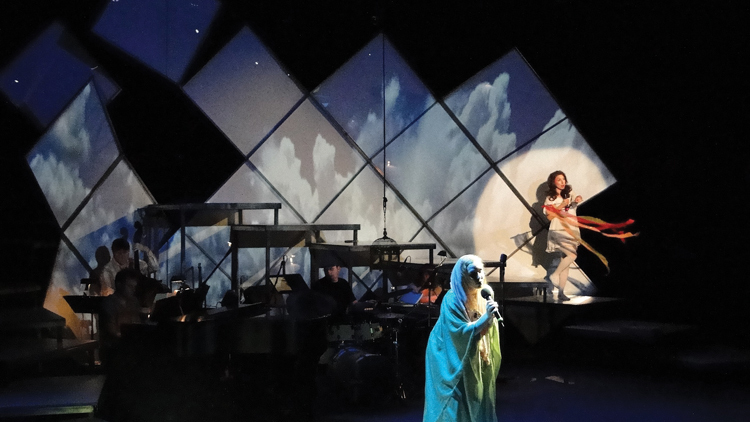 (Photo left, Little World by Ki Gottberg, independent AEA production. Scene design and puppets by Carol Wolfe Clay. 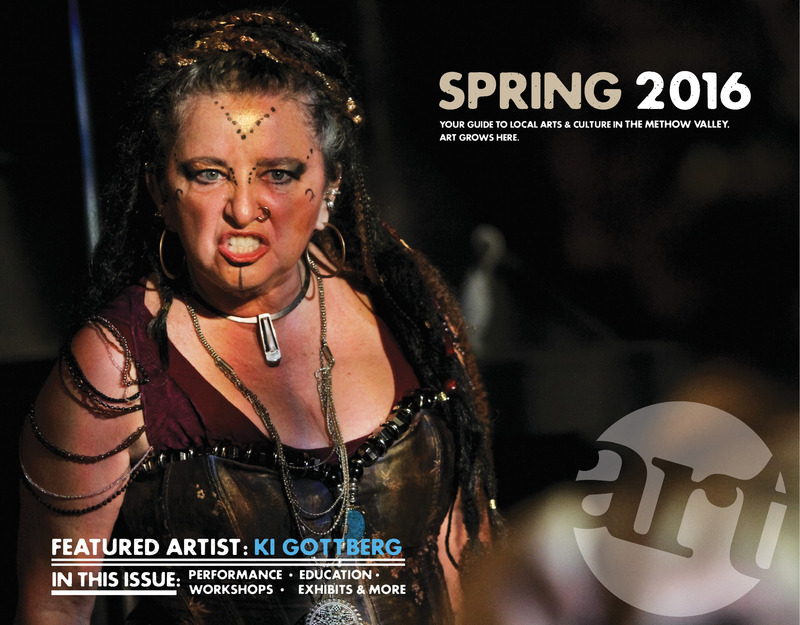 In addition to teaching, acting, and directing, Gottberg still writes for theater, creating plays she describes as “really experimental and avant-garde.” One features a basketball court and a piano, girls in wheelbarrows, and objects that speak. Gottberg likes to break the “fourth wall,” the imaginary barrier between the actors and the audience. “My work really plays with the conventions of theater,” she said. (Photo right, Ki Gottberg, directing her play ‘The Last Salmon’ at The Merc Playhouse. 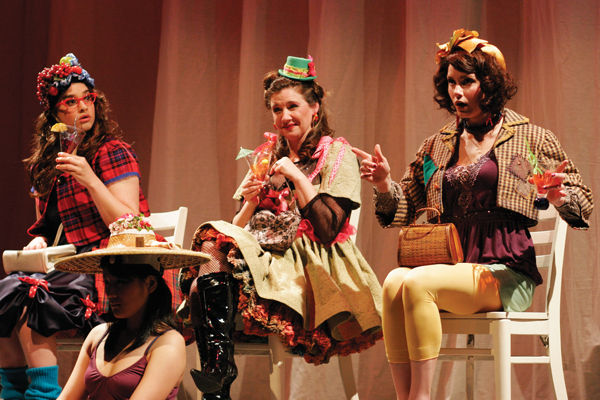 In addition to three or four major staged productions, each season at the Merc includes several plays done as readers’ theater. Readers’ theater has proven popular with actors, since it doesn’t require as great a time commitment and it provides an ideal entry for people with little – or no – experience acting or directing. Some theater-goers have told Gottberg they actually prefer it, because it removes the distractions of scenery and costumes. “People worry about memorizing their lines – that’s the easy part. What’s hard is embodying the character,” she said.